The first time I used Product Launch Formula was around early 2008 if I remember right. I was helping people build websites with an all-in-one system I won’t name, because looking back, I should have been using WordPress instead. Don’t we all have those things we regret? I’d built up a pretty big following of beginners to online marketing, and was doing my best to help them with free coaching when they purchased the website building product through me. Not a sustainable business model at all, but back then I didn’t know any better. But I had a lot more to teach people who wanted to get a more advanced education, so I created a more advanced course that covered the basics of setting up a website at a higher level, and a deep dive into the stuff that helps people get the money. After all, that’s what people wanted – a way to get paid for the time and effort they were putting in. So anyway I used the Product Launch Formula process to do what Jeff Walker calls a Seed Launch. It’s a launch to your internal list where you GET PAID up front and actually create the product as you go. I’ll tell you how my Seed Launch went in a minute, but first, let me tell you a bit more about what they are, and what they can do for you. 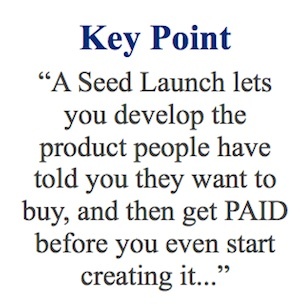 Basically a Seed Launch is a way to make a bunch of money before you know exactly what the product is going to be, and before you create anything. You come up with the nuts and bolts of the product based on what your readers really want to learn, so when you launch, you know there’s going to be demand because you are giving people EXACTLY what they want. And you can base your marketing on the words and emotions people use in the surveys you do as you flesh out the content of your course. So for instance, if your readers tell you they are sick of not being shown any respect by their peers or their spouse, you can show them how by buying your product, they can turn that around, and start to be admired by others and win back the admiration and respect they crave from their husband or wife. Or if people tell you they lie awake at night worrying about their children getting caught up in the local drug culture or gang violence, you can talk to them using the same fears and emotions they shared with you to show them how your product can keep their children safe and out of harm’s way. That’s why Jeff Walker’s Seed Launch process is so good. You can create the product based on EXACTLY what people want to buy. And you can perfect the marketing pretty much under the radar to your own internal list, so none of your competitors know what you are up to. Then once you’ve got all of your ducks in a row, you can do a full JV Launch using the rest of what’s taught in Product Launch Formula, and quickly bring in hundreds or even thousands of new customers. I just completed a stand alone course Jeff did with a couple of hundred students, where he did a Deep Dive into his Seed Launch Process. 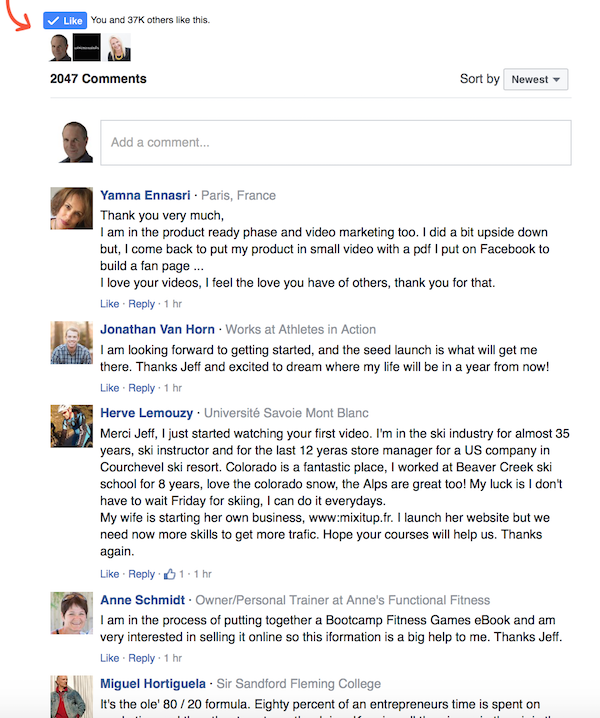 The course was over 4 weeks, and we had a dedicated Facebook community that was rocking throughout the course, and is still active today more than a month after the course ended. Anyhow, since Jeff has said this latest release of Product Launch Formula is totally new, I wouldn’t mind betting that one of the bonuses will be access to his Seed Launch Formula training. Don’t get me wrong, the Seed Launch training inside the original PLF course is good, but the Seed Launch Deep Dive goes way deeper and shows exactly how to pull off one of the easiest and most profitable marketing campaigns you’ve ever done in your business. For my Seed Launch, I didn’t want to get too greedy, so I priced my training at $77, which was a 50% discount on the price at the time. I made what at the time seemed to be a pretty good offer, although looking back it wasn’t what you’d call irresistible, but considering it was my first attempt at a launch, I made back more than twice the money I spent buying PLF in just over 7 days. With ZERO cost apart from Paypal fees and some of my time to do the training. But that Seed Launch was the start of good things for me. I’ve done quite a few more since then, and every one has made good money. And it’s just part of what Jeff shares in Product Launch Formula. If you’d like to know more about what’s covered in the latest version – check out Product Launch Formula. This entry was posted in Product Launch Formula Training and tagged benefits of a product launch, creating your information product, free product launch formula videos, jeff walker, jeff walker product launch formula, PLF 4, PLF 4.0, PLF4.0, product launch formula, product launch formula bonus, product launch formula review, product launch formula reviews, the seed launch on by reviewer.